There are few radio or television shows I bother to make the effort to regularly catch. A radio show I always do my best to listen into is Open House. Open House is a weekly talkback and interviews show discussing life, faith and culture that broadcasts on Christian radio around Australia. If you are in Australia, tune in on Sunday nights. If you are not in Australia or for whatever reason can’t catch the show, you can download the podcast. 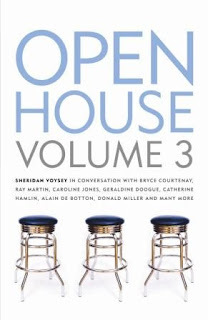 Recently interview transcripts from the show were released as the book Open House 3. One of the things I love about the show that is reflected in the book is the diverse range of guests. The book includes actors, authors, journalists, activists, psychologists and even a former mob member! Some are Christians and some are not, some are local to Australia and some come from other parts of the world. Not only are the interviewees diverse but interesting too. Sheridan does a great job at asking the right questions to get people talking. I found the interview with Joel Osteen fascinating because in it he responds to some of the common criticisms against him. Catherine Hamlin’s stories about working with suffering women in Africa had me crying. As a fan of books by Mark Driscoll and Donald Miller I enjoyed hearing their stories and some of what inspires their work. Other interesting interviewees included Gary Chapman, Melinda Tankard Reist, Bryce Courtnenay and Marilynne Robinson. I highly recommend this book. It will give you lots of worthwhile food for thought.